On the morning of Christmas Eve as my family and I were getting ready to go to North Carolina to visit my parents-in-law, I received an email from Mr. Sheng Liren whose information I had found on the same school alumni page. He is Sheng Shuren’s brother, seventeen years his junior, a retired professor of mathematics. Before I accidentally heard Sheng Shuren’s story from Erjia, he seemed to be the only person I could potentially find, so I wrote him a letter and sent it to the School of Mathematical Sciences of Anhui University where he had taught before retiring. I did this just to give a try without really expecting too much—perhaps he had moved; even if he got it, it didn’t mean he would respond. I said in my letter that I wanted to write the story of Mr. Sheng Shuren; but he could be one of those people who tells you to “stay away from history,” or even if he wanted to tell the story of his brother, it was entirely another matter whether he would entrust it to a stranger. Narrative is such a dangerous thing. Something happens, seemingly straightforward, but how it can surprise us when it is narrated. It can be a pleasant, even amazing, surprise of course; but more often, god knows what it will become when breathed out through a narrator’s words, and how it can, in a hundred different ways, make one feel wrong. He said he and his wife had recently come back from visiting their son in Washington, DC’s Maryland suburbs, and it would have been so easy for us to meet. But then again, he said, the letter might get lost if he was not around. To my surprise, the arrest and dismissal I knew and referred to in my letter was the second time for his brother. The first time, he was removed from the Xinhua News Agency on Trotskyite spy suspicion. Both times when he went to Xinhua, said Mr. Sheng, my father advised him not to go, but both times he didn’t listen, and it must be fate for him to end like that. He said, my brother died on the streets of Shanghai without a family member at his side and a stranger closed his eyes for him. As though to soothe himself, Mr. Sheng added, perhaps it was his luck that the good god took him to heaven with a pair of wheels from a life worse than death. It was a comfort to me that Mr. Sheng also mentioned “the responsibility not to forget,” even though I myself didn’t say so in my letter. It would be too much of a goal for me to lay claim to, not to say it is all but impossible as generations of people have already vanished, the last of them on the brink of vanishing, along with their stories. Most of the survivors, during the last years of their life when they had been reinstated and enjoyed “freedom,” kept complete silence about what they had gone through. If possible, I just want to tell, if only obliquely, the story of one man that I happen to have stumbled onto that hurt me deeply and will not go away. At the end of his letter, Mr. Sheng apologized for writing so much the first time and for the little outburst he could not contain. I wrote him back immediately thanking him for his reply, so much more on a day when lights decorated everything, the smell of roasted turkey and the sound of Christmas carols wafted in the air, and everyone was on their way home for the holiday. Police station on Gordon Road. When I called Mr. Sheng after the Christmas, we started from Sheng Shuren’s two stints at Xinhua. My brother graduated from St. John’s around 1942, Mr. Sheng said, I was only a little boy and I remember my family attending his graduation ceremony and him wearing the robe and holding me up for pictures. Shanghai then was under Japanese occupation; jobs were hard to come by. His first job was as a translator at the Gorden Road Police Station. Later, he passed exams to work first for the North China Daily News and then The China Weekly Review. Perhaps it paid too little to work for the papers, Mr. Sheng said, he found employment at the British Consulate in Shanghai on The Bund. That was the last job he held before Shanghai was liberated. He had already married then and had two children. When Shanghai was liberated, he was very happy. The Communists weren’t strangers to him: he had developed good feelings toward them at The China Weekly Review, and Qian Zhengying, the younger sister of his best friend Qian Weifan from St. John’s, was a communist party member while studying at Datong University in Shanghai and later became the Deputy Minister of Water Resources of the republic. The Qians frequented our house when I was little, said Mr. Sheng, and they spent time together all the time. At the same time, his jobs had exposed him to the elite of the ruling Nationalists and he loathed their rottenness. Now the country had a new regime, he could finally have a career in journalism that he wanted so badly, so he set his mind on working for the Xinhua News Agency which, in turn, welcomed him with equal enthusiasm. My father had his reservations, Mr. Sheng said, and advised him not to go, while his friends from the Consulate, which had moved to Hong Kong, urged him to join them. He expressly rejected them all. 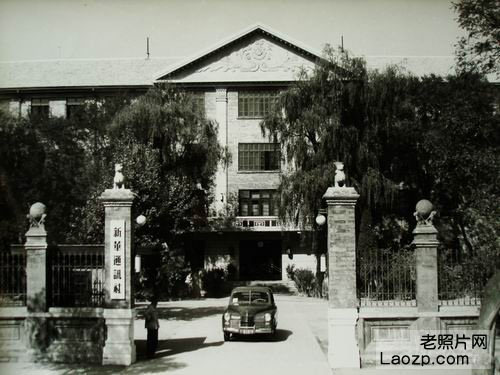 Xinhua News Agency in 1950s, on the site of the National Congress of the Republic of China that communist China ended. Up until now, Mr. Sheng had been speaking evenly and matter-of-factly, a sudden stress then fell on the word “expressly”, ejecting it out of the sentence. I totally understand the choice of the man, a journalist by training: Now that China is unified, has a better regime, if I can work for the highest news agency in my own country, why do I want to be employed by a foreign consulate where I, a foreign national, don’t have a viable prospect? When in 1950 Sheng Shuren moved to Beijing, with his wife and two young children, how he envisioned his career at Xinhua as a journalist, I can only imagine. The news from Beijing was that, his job was listening, all day long wearing headphones, to the English broadcast of the western countries, especially the Voice of America, transcribing, translating and presenting it to the leaders of the Communist Central Committee. And the head of the Agency thought highly of him. From what I have read, the International Department of the Xinhua News Agency was, at the time, the only place in China that had access to foreign media, and three binders of Information Compendium for Reference, over ten thousand words together, were produced and sent to the desks of the Party’s leaders each and every day at fixed hours in the morning, afternoon and evening. Of the non-stop waves of political campaigns in the 1950s, I know the Land Reform, Suppression of the Anti-revolutionary, Three-Antis and Five-Antis Campaigns, Purge of the Anti-revolutionary Within, Anti-Rightist Campaign, and the Anti-Right-leaning Campaign, but I have never heard of the Purge of the Trotskyites. It refers to the sudden arrest and the subsequent imprisonment of so-called Trotskyite suspects that occurred simultaneously in major cities nationwide in the evening of December 22, 1952. It was the day after Stalin’s birthday, and it is said to be Mao’s birthday gift to Stalin. Like all purges of the Communists, it was violent and presumes people guilty for their faintest associations. My brother was suspected of being a Trotskyite spy, said Mr. Sheng, because there were self-proclaimed Trotskyites among St. John’s students who might have been his classmates or even friends; also, all the jobs my brother had had before the Liberation had to do with foreigners one way or the other, and in the eyes of the Party, every square inch of him was suspicious. After his arrest, his wife returned to Shanghai with their three children—the third was born in Beijing and still a baby. The review of him went on for over a year, said Mr. Sheng, and during that time my mother travelled to Beijing to visit him, staying with my eldest sister. After obtaining a referral from Xinhua for her visit, a rickshaw my sister had hired took her to a prison. My mother showed the people there her referral but was turned down. She sat outside the prison gate without leaving, hoping to try her luck again in a while. But before long, two female guards came out and drove her away harshly. My mother went back to my sister’s, saying she had heard the sound of hammers crushing stones and was convinced that her son was being subjected to punitive labor. Even more upset now, said Mr. Sheng, she went again to see my brother. Once again, they turned her down. And my mother began to cry. Who knows, said Mr. Sheng, perhaps the two women guards felt pity for her, they let the mother and son meet. My mother asked my brother whether he was doing forced labor, my brother said, No, no, I am just reading inside. (I have learned from the memoirs of other arrested Trotskyite suspects that the books they were given to read included a booklet titled Flushing out the Imperialist Spies Trotskyite Gang of Bandits.) But we would never know the truth, said Mr. Sheng, because with the guards standing next to them, he wouldn’t dare to speak the truth. I chorused in agreement. Having read enough accounts of similar meetings, I can very well imagine how those few minutes, no more than ten, of the mother and son’s meeting went, the short words and the long silence, and I have never come upon a single account of a private meeting. A year or so later, Sheng Shuren’s case was closed, they concluded that he was not a Trotskyite, but removed him from the Xinhua News Agency anyway. In other words, the spy suspicion was still there even though they had found no evidence to support it. Returning to Shanghai, Mr. Sheng said, his brother found a job in a high school and taught Chinese. Chinese? I was surprised. Of course, don’t you know? Said Mr. Sheng, schools then taught Russian only, and English was deemed a reactionary, capitalist language. Of course I know, but how easily we forget things. He taught for a while, said Mr. Sheng, and around 1956, the Xinhua News Agency wanted him back. This time, my father opposed it vehemently, arguing he would be better off staying in his teaching job in Shanghai. Once again, he didn’t listen. Two years later, said Mr. Sheng, we learned from a letter of his that things had gone wrong yet again. By T in Uncategorized on June 27, 2012 .